President of Russian Federation Vladimir Putin meets with President of China Xi Jinping and President of Mongolia Tsakhiagiin Elbegdorj. President of Russia Vladimir Putin had a meeting with President of China Xi Jinping and President of Mongolia Tsakhiagiin Elbegdorj. The three leaders discussed, among other things, work to promote trilateral cooperation and prospects for its further development. 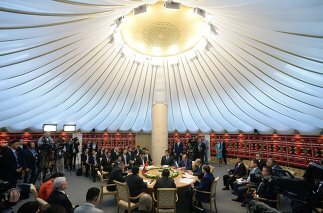 Last year, in Dushanbe, we essentially opened a new page in the relations between our nations and launched a mechanism for trilateral meetings at the highest level on the President of Mongolia's initiative. As they say in the East, a journey of a thousand miles begins with the first step, and it has been made in the right direction. Of course, it is probably more difficult to come to a trilateral agreement when we must take into account the interests of each partner than to engage in bilateral dialogue, but Russia, China and Mongolia are close neighbours, united by rich historical traditions of friendship and good neighbourly relations between our peoples. We understood the enormous potential of Russian-Chinese-Mongolian cooperation, so we instructed our relevant departments to begin coordinating concrete areas in our cooperation. And today, we can draw some conclusions. In the last year, we have had three rounds of consultations at the Deputy Foreign Minister level; in May, the first meeting between transport ministers was held here in Ufa. The Russian side presented an initiative to strengthen the comprehensive nature of our trilateral cooperation through a special document: a roadmap. A corresponding project is prepared for each meeting establishing priority areas of cooperation: politics, security, the economy, trans-border and interregional ties, science and technology, the humanitarian sector and international affairs. I would like to propose that we adopt this road map. In addition, we signed several documents on the sidelines of our meeting: a memorandum on mutual understanding on the creation of an economic corridor (the initiative was presented by Chairman Xi Jinping back in Dushanbe), an agreement on cooperation in the development of checkpoints along the border and a memorandum on the creation of favourable conditions for developing trade. Experts are working on other promising projects, such as constructing transit power lines from Russia to China across Mongolia's territory and the creation of a trilateral transport and logistics company. Relevant companies are exploring the formation of a transport corridor based on the Ulan-Bator railway. Talks are underway to deepen cooperation in tourism. On March 27, the second coordination council on cooperation in tourism was held in Irkutsk with support by our Rostourism department. The meeting addressed specific joint projects: organising a "Great Tea Road" tourist route, a special Star of Eurasia tourist train (Beijing-Chita-Ulan-Ude-Irkutsk), the formation of a cross-border tourist cluster and holding an international tourism exhibition. I'll take this opportunity to once again thank Chairman of the People's Republic of China Xi Jinping and President Elbegdorj for participating in the May celebrations in Moscow honouring the 70th anniversary of Victory in the Great Patriotic War. In Ulan-Bator last September, Mr President of Mongolia and I participated in celebratory events honouring the 75th anniversary of victory at the Khalkhin-Gol river and paid tribute to the memory of Soviet and Mongolian soldiers. And on September 3 of this year, we will all be celebrating the 70th anniversary of the end of World War II in Beijing. This is a memorable date for the entire global community and, of course, for the peoples of Russia, Mongolia and China.